An Observational and Imaging Success. This paper received the Webb Society's Annual Award For Contributions To the Society's Publications for 1998. The Award was presented May 13, 1999 to Barbara Wilson by Dr. Brent Archinal of the U.S. Naval Observatory on behalf of the Webb Society of Great Britain. Awarded at the Texas Star Party in Fort Davis, Texas. This paper is dedicated to the memory of Mike Morton. Large amateur telescopes have become commonplace in the last 10 years. At star parties we regularly see telescopes ranging from 16 to 25 inches in size, and some that are over 25 inches of aperture. These telescopes are helping amateur astronomers push out the frontiers of observational astronomy to the farthest reaches of our galaxy and beyond. Distant quasars and clusters of galaxies are now on observing lists and more importantly observers are quite successful in seeing these vague patches of light. A project I have embarked on is to observe all the Milky Way globular clusters visible from my latitude, which is at 29.5 degrees north. There are currently 147 galactic globular clusters confirmed as of 1998. After finishing the Messier and Herschel 400 lists it seemed to be a natural progression to observe all the known globulars. There are 29 globular clusters on Messiers list of 110 objects. There are 74 globulars which have NGC numbers only. 15 more are designated "Palomar" globulars. These were discovered during examination of the Palomar Sky Survey Plates back in the 1950s. 11 additional globulars have the name Terzan attached to them. They were discovered by Agop Terzan in France doing infrared work. 18 more globular clusters are not on the above mentioned lists, and two of these are new additions: The Pyxis System in 1995 and IC 1257 in 1996. Having seen all of the Messier and NGC globulars in the course of observing the Herschel 400 and the Messier Catalog, I noted that all but 10 of the known globular clusters were above my horizon. I began this project in 1990, thinking this would be a short summertime project! Little did I know at the time, I would not finish until the summer of 1997, culminating with the faintest globular of all - UKS-1. I now have 10 southern hemisphere clusters left to observe. I have kept detailed observing notes on each cluster, and have drawings of some. Globular clusters are the most ancient objects in our galaxy. These crowded spherical swarms of stars are found in both the disk and the halo and the extreme halo of the Milky Way. The greatest majority are found nearer to the galactic center in the constellations of Sagittarius, Ophiuchus, Scorpius and Centaurus. The extreme halo clusters are found in many different constellations, whereas the bulge clusters (Terzan) are found near the galactic center, and were discovered using infrared sensitive films. 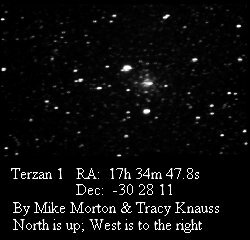 In the course of this observing project, I became an co-author (along with amateurs Czernic Crute, Brian Skiff, and Brent Archinal) and numerous professional astronomers of a paper in the February 1997 Astronomical Journal entitled "IC 1257 The Newest Globular Cluster of the Milky Way." For a modern amateur this is an ultimate occurrence. To the best of my knowledge, these are the first sucessful observations of all the Terzan globular clusters and UKS 1. Certainly, these are the first CCD images of the Terzan clusters done by amateur astronomers. There are CCD images for finding charts and my observational notes.in this article. 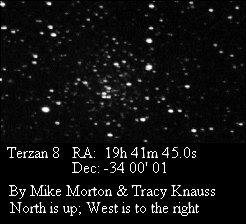 Mike Morton and Tracy Knauss imaged these globular clusters in the summer of 1997. We hope that these images will serve as finding charts allowing observers to locate the exact positions in the crowded starfields of the central regions of the Milky Way. Most all of the images have at least one star that is visible on computer charting programs like MegaStar. The positional data on the Terzan chart in this article gives the best information to date, and was taken from Harris database. (see reference 2) Use the positional information to edit your star charting programs that probably have incorrect or imprecise positions. If I had had images like these to begin with, this observing project would have been so much easier. All of my observations were completed before the images were made. The images of the Terzan and UKS1 globulars were done with the Cookbook 245 plus CCD camera. 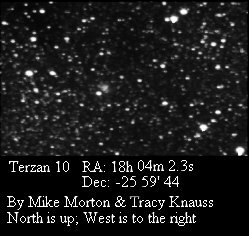 Mike and Tracy used an 18" f4.5 on a fork mounted Newtonian telescope in the east dome of the George Observatory located south of Houston, Texas. A total of 4 images of each globular were combined with the darks and flatfields subtracted, in creating each final image. After the excitement of the discovery of IC 1257, I turned my attention to UKS 1 again. UKS 1 is plotted on Uranometria page 339, using a small globular symbol. Naively, I originally had thought any object plotted on Uranometria would be visible in a 20"! The first time I tried I used the Uranometria chart. This was in 1993 at the Texas Star Party. Thereafter my quest for UKS 1 became an annual summer undertaking. It was invisible on the Digital Sky Survey and on the Palomar Sky Survey Prints. All I could do was plot its position using the 2000 coordinates of 17h 54 min 24.7s 24 degrees 08 50", and search around the starfield indicated. Could the coordinates be trusted? I didnt know, since I searched for published papers that contained images without success. For an object that has an integrated visual magnitude (estimated) of 17.3, searching its probable location is not enough. Using a MegaStar chart the nearest star is 2.6 away from the globulars position, a lot of sky to cover when you are looking for an object at the limit of vision. An observer needs to know exactly where the object is in relation to faint field stars, which requires a visible image. At the 1996 Texas Star Party using a POSS chart I again attempted UKS-1 with my 20" to no avail. I tried with Larry Mitchells 36" (.9 meter) telescope. The results were not conclusive. In the eyepiece field there is a faint triple star and a double star near where UKS 1 lurks. We searched around both sets of stars, and concluded that unless we knew exactly where the object was in relation to these sets of stars we would never see it. I now had strong suspicions that UKS 1 would not be visible in a 20". But I was determined to find its exact position in the starfield and again look for it. I turned to Brent Archinal at the U.S. Naval Observatory for help, since so little was published on it and I could not locate any finder charts . Brents research informed me that UKS 1s actual discovery was a private communication between professional astronomers. The "discovery" paper is M. Malkan, D. Kleinmann, and J. Apt (1980), "Infrared Studies of Globular Clusters Near the Galactic Center," ApJ, v 237, pp. 432-437. They note: "UKS 1751-241 is completely invisible on the Palomar O (blue) and E (red) Survey prints. It was discovered by Longmore and Hawarden (private communication) on IV-N infrared plates taken with the 48 inch (1.2 m) UK Schmidt telescope; on these plates it appears as a small round, hazy patch, no brighter than I (0.83 micrometers) ~16 mag." This at least explains why it's not visible on the POSS. I used Skyview to look at the area, using the DSS (apparently the UK Schmidt survey in this case), where as suggested above, nothing was detectable. I also looked at the IRAS surveys in this area, and also the IRAS point sources and faint sources and found nothing. This is disturbing as I would think something would show up on one of these surveys or catalogs. SIMBAD lists 14 references for this object (including the discovery one). I haven't looked at them all, but from the titles and abstracts alone, it seems as if none but the discovery one discuss this object in particular - so I doubt there are any published images of it. The list of references is attached at the end of this message. I may try to look at the other references eventually, but if you follow up on this and find anything in the meantime please let me know. Djorgovski and Meylan (in their ASP Conference Publication) just give the position and apparently all other information right out of the discovery paper. So, in summary, albeit without a thorough check, it appears that this object is really only described in one publication (citing a "private communication"), and there are no published images. This certainly leaves me wondering if it exists. After checking all the publications, maybe the only thing left to do would be to write Malkan, et al. and try to get a (print) copy of the discovery plate." I discussed UKS 1 with my observing friend Andrew Murrell who lives in Australia and has a 20" telescope. Since UKS 1 passes high overhead from his dark sky location I figured he had the best chance to observe it. Andrew had not seen it. A decent finder chart was now imperative. 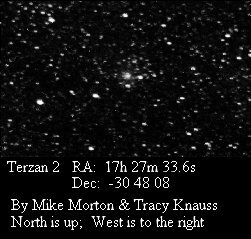 Mike Morton and Tracy Knauss readily agreed to image UKS 1 with a Cookbook 245 CCD camera on the Ft. Bend Astronomy Clubs 18 f 4.5 telescope at the George Observatory where I am employed. Using the POSS chart to locate the area, I suggested that they take images along a line about midway between two 11.3 and 11.4 magnitude stars, near the faint double and triple stars. On the second image the globular revealed itself. (See accompanying image.) 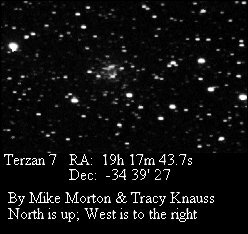 Mike and Tracy took several 4 minute exposures that showed the cluster easily. The cluster was discernible in the "find" mode of the camera. The CCDs great sensitivity to highly obscured objects that shine mostly in the infrared, was readily apparent. This globular has one of the highest extinction ratings of any known globular cluster; with an extinction of B-V = 2.93. The cluster was fuzzy and unresolved in the image, because to resolve this cluster requires a telescope that can reach stars of 25.5 magnitude! Armed with an excellent CCD image, I now had a chance to see if UKS 1 (or even a minute part of it) would reveal itself to a mere mortal equipped with eyes only sensitive to yellow green light. On the morning of July 5, 1997 at a power of 663 in Larry Mitchells 36" telescope for the first time I haltingly saw a small (30") round nebulous glow at the exact position revealed by the CCD image. 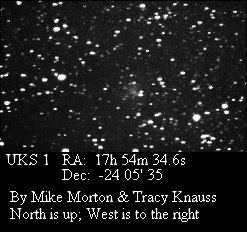 UKS 1 was at the very limit of the 36" from Columbus, Texas (our dark sky site). The great contributing factor that morning was the excellent seeing conditions allowing us to use high powers. We looked a long time. Using a 9mm Nagler (508X) Larry received its faint photons, but I did not. It was only with the 7mm Nagler that I could see it intermittently. I gained confidence that I was actually seeing it when the image "hardened" several times at the correct place over many minutes of observing. To be sure it was real we asked another observer to look after carefully showing him exactly where the object was. After a long while, this observer did a field sketch at the eyepiece and it confirmed our observation. My husband Buster also felt that he fleetingly saw something at the correct position. I did a detailed drawing of the field with the 7mm eyepiece. It was important to keep my averted vision exactly concentrated on the place, else the object was invisible. east than the separation of the stars but eqidistant between them. all the globulars in the Milky Way galaxy. Maybe from the highest mountaintop with sub arc second seeing UKS 1 might be visible in a 20" telescope. Nevertheless it is visible to amateurs equipped with the largest telescopes and a breeze for those with more modest aperture and the "magic" of CCDs, and a good chart. No longer is that true. Extremely faint haze suspected. Size is estimated at about 1 minute. Also known as HP 2. The globular is 6.5 kpc from the Sun. X Ray Source. I detected 2 glows in field of 9mm. 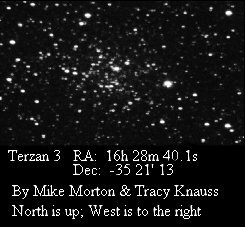 One may be VDB-HA 228 a faint open cluster of about 1.5', the other may be Terzan 2. Both glows appeared about the same size and confused me, as I was expecting only one object, leading me to believe I was imagining seeing these. Checked later on MegaStar and saw the plotting of the open cluster. Drawing seems consistent with positions of objects. Extremely faint, at limit. 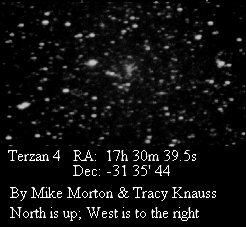 Terzan 2 on 5/24/95-Reobserved. Seen as plotted on MegaStar. There is a loose appearing almost open cluster looking haze with 5 faint stars in a squarish formation to the north of a star of about 11th mag. The core of this tiny globular is to the east of the 11th magnitude star. This is a infrared globular deep in the Scorpius Milky Way only 1.6 kpc from the galactic center. Also identified as HP 3. 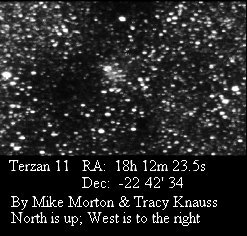 Just to south and west of a faint double star of 14th Magnitude is T3, extremely small faint glow, very tough to see. What I have detected is obviously only the brightest central portion, since this cluster is large. It is 26.4 kpc in distance from the sun. This extremely reddened tiny cluster which is very close to the galactic center (.9 kpc) is the third faintest globular cluster. Suspected with 7mm (290X 16.9 field) just off the Sky Cat position. It maybe just slightly more visible in Larry Mitchells 36" need to check field and reconcile with what I saw. Also identified as HP 4. I estimated size at .7 of arc. 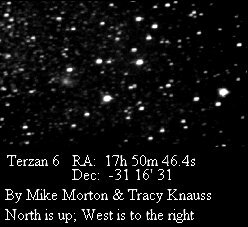 Terzan 4 on 8/30/97-Reobserved at 10:30 PM using 20" f./4 with 4.8 Nagler. 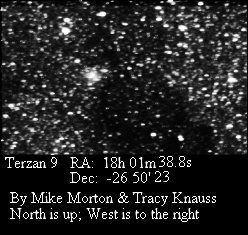 Terzan 4 seen as a small 60 second spot of tenuous light 1.7 minutes southwest of a 9.8 magnitude star, it is very small but clearly discernable with averted vision at 423 power. 2' glow small and faint but seen with direct vision! Exactly as on POSS. Checked POSS later, the two stars I drew are in the cluster. So the brightest stars must be much brighter than the horizontal branch implies. This globular looks like a tight condensed patch of light with 2 stars resolvable. Terzan 5 is another extremely reddened globular. 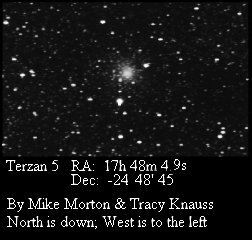 It is listed, along with Terzan 6 and 9 as the closest globular clusters to the galactic center at only .6 kpc from the center. Terzan 5 is an x-ray source. Clusters which are located close to the galactic center, include Terzan 1, Terzan 2, Terzan 4, Terzan 5, Terzan 6, Terzan 9, Terzan 10, and UKS 1. Some of these clusters are obscured by up to 10 magnitudes in visual extinction. Not visible, though carefully starhopped to position using MegaStar chart with stars visible to 14th mag. Also tried 4.8 Nagler as well over 500x, not visible with any power this night. Plot on MegaStar shows VDB-HA 249 (open cluster) at almost exact position, are they the same? Second attempt at TSP94 May 12 with Brent Archinal observing with me. Neither of us felt confident that we saw T 6. A suspected object at the position of the globular turned out to be a group of 5-6 stars at higher powers. Brent Archinals notes: I don't think I've looked for any of the Terzan globulars visually, except that you and I tried to find Terzan 6 with your 'scope at the '94 TSP (May 12). My notes are "Terzan 6, not found - Looking for Terzan 6 and found at low power what I thought was it, but at high power shown by Barbara to just be a clump of stars, 5-6 stars, but very small spot at about that position." Maybe you can get some time on Larry Mitchell's 'scope this May and look for it. Sometime in the next couple of years I'll give it a go with the Rupp 31-inch in Ohio, although at about 20 degrees altitude on the meridian there's little chance I'll see it from there. Update 7-6-97 - Using POSS chart from Digital Sky Survey, I visually star hopped to exact field for at least the 3rd attempt on this cluster. It was not visible using 9mm Nagler. However Larry's 36" did show it fleetingly with a 9mm tonight. I did a drawing of what I saw. Extremely difficult and weak in the 36" from Columbus. This highly compact globular at 6.8 Kpc is very reddened with an extinction of E (B-V) of 2.04. It is an x-ray source and has a collapsed core. The weak glow of the core of the cluster is 40" south of a 12.3 magnitude GSC (7377:1210) star and almost touching a star of about 15th magnitude estimated. Using field size of 21.6 minutes I drew the field. This globular is large and has a low surface brightness, several stars were seen in glow of object and drawn in. Deep in the Milky Way but it does not suffer from extinction unlike most of the Terzan globulars. I estimate its visual size at 6 minutes. 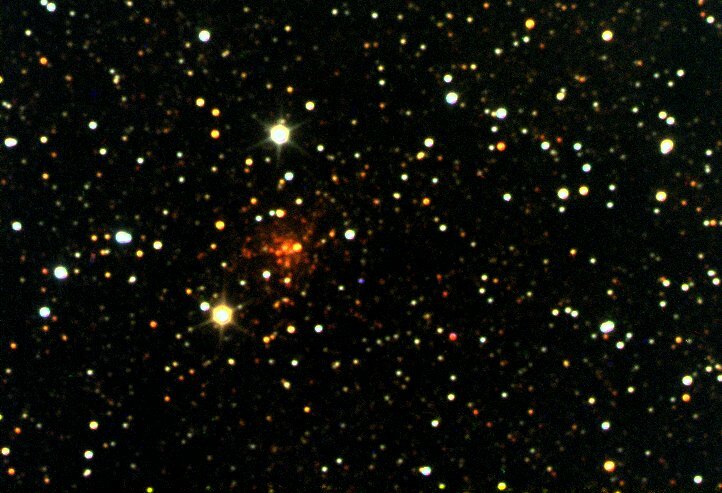 Terzan 7 is one of 4 known young globulars that may have been captured by the Milky Way along with Arp 2,Palomar 12, Rup 106 according to recent professional literature. Also Arp 2 and Terzan 7 lie very close to the New Sagittarius Dwarf galaxy. This is the brightest and prettiest of the Terzan globulars! Seen just after Terzan 7 this night. This globular is fainter and I see a very faint small glow at position, I must only be seeing the glow of the center stars, but not resolving them at all. It is located about 3 degrees south of M55. Low extinction in this area as galaxies are plotted nearby. Update 8-30-97 11:33 PM 20" f/4 using 20 mm Nagler - This globular is very large, but diffuse. At times it actually seems grainy as a faint sprinkling of stars can be seen across the large glow. It seems to my eyes to appear more like a Palomar type globular than a Terzan globular. It is really there. The 11 mm Nagler did not quite pull it out of the background sky but the 9 mm did. Extremely weak object just at the plotted position. The cluster is very close (3') to a very elongated right triangle of 3 stars about 9-10th magnitude. Two of the three stars point to a faint star not plotted on MegaStar, of about 16th magnitude. The globular is just to the west of the faint star. The cluster itself appears visually larger that on the POSS print. The glow is maybe 1' in size. The cluster is just on the edge of a dark dust lane in the Milky Way as the CCD image shows. One of the biggest problems in finding this globular is the incorrect positional data in several sources including Sky Catalog 2000. So it took a while to sort things out, Harris position is correct and is given above. Looked at field at exact position as plotted on POSS print, finally did see Terzan 10 but not in the 20". I saw it in the 36", but it was difficult. I did drawings of the field, the problem with Terzan 10 is that it is very near (less than a 1 of arc) from a 11.8 magnitude star (GSC 6846:1151) which makes observing this object difficult and it is tiny, I estimated less than 1' of arc. An iffy observation, every once in a while we (Larry and I) thought we saw something on a line between a very faint star northwest of the GSC star, an elongated glow, but extremely tentative. But another time and another place, it may be visible in a 20". I suspected it in the 20" under darker skies in May. This time I did not see it in the 20". This on again off again globular cluster was reinstated in 1994 as a globular based on infrared photometry. The foreground reddening E (B-V) is: 2.64. Terzan 11 - This was a 2nd attempt on Terzan 11 (Which Bill Harris calls 12) and was a success in the 36". This is a brutally tough object. It was a weak glow in the 36" near two fairly faint stars visible on the Palomar Sky Survey Prints. The globular is to the north of these two stars. It was not visible in the 20". I used the position William Harris gave in his database of Milky Way globulars, which is the same position in the table I made. It is exactly correct. Larry had it plotted nearby but his position turned out to be a small asterism of faint stars the correct Harris position is southwest of where Larry had originally plotted it. To confirm our visual observation, we asked Takao Doi to take a CCD image of Terzan 11 ( ST 6 and a 12.5" Takahashi reflector) who was also at the observing site. Sure enough the CCD image showed a grainy glowing object at the position I had plotted from the POSS. Incredible extinction in this area lots of dust. Takaos image showed the globular to the north of the two stars we used visually to pinpoint its location. The CCD image showed great extinction by dust in this region, as evidenced by a strong lack of stars in a large dark area near the cluster. Saw a very weak glow in the 36". This is the object that has had much confusion surrounding its designation. It was originally designated by Terzan as Terzan 12 and he renamed it Terzan 11 when he discovered that the original Terzan 11 was a rediscovery of Terzan 5. Authors: LIU, T.; MCLEAN, I. S.; BECKLIN, E.; BOLTE, M.